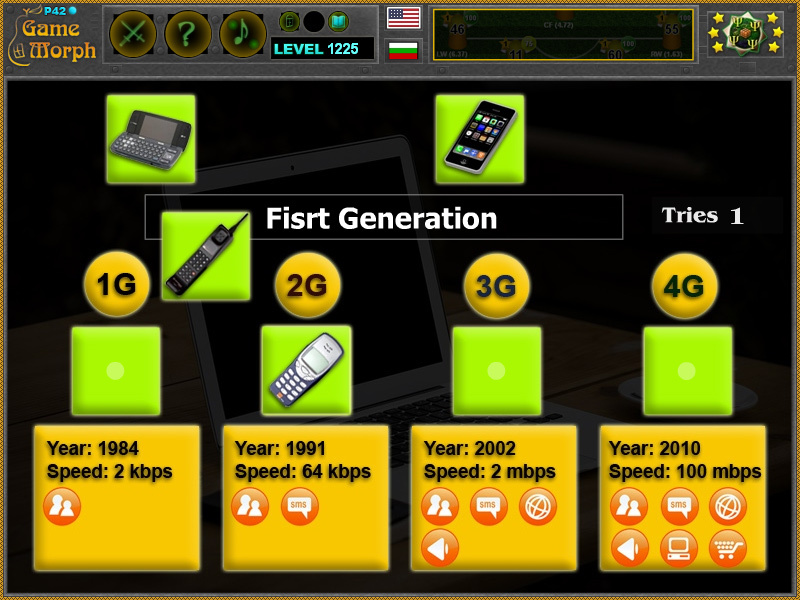 4 generations of mobile communications in a fun online IT learning game. "Mobile Generations" is a free online knowledge level game to explore and study the generations of mobile communications and their properties. Minute to win it game. Interactive computer technology class for desktop computers, laptops and tablets. Put the device in the correct mobile generation. Computers learning game, suitable for online classes and interactive lessons. Free online educational game. IT lesson 7 for 8 grade clasroom game. How to play Mobile Generations. There are 4 comunication devices at the top of the screen. Drag and drop them in the correct generation of mobile communication. Sort all 4 pieces to win the game. Know the 4 mobile generations and get +1 Knowledge Level. Development of mobile devices begins with the analog telecommunications standards that were introduced in 1979. The First generation 1 G (1984) - mobile phones (called mobiphones) are used to connect via an analogue voice-only connection. They have limited service range. The Second Generation 2G (1991) - introduces the use of GSM (Global Service for Mobile Communications) through digital systems, adds the ability to send MMS, use mobile internet, and more. Third generation 3G (2002) - Universal wireless connectivity systems that offer a wide range of multimedia, video calling, high-quality Internet access are used. Fourth Generation 4G (2010) - Provides wireless connectivity over long distances to different devices, with data rates faster than 3G networks. A Fifth Generation of mobile communications is proposed for 2020, which is supposed to be faster and more reliable. Labels: Games about Computers , Classroom Games , Mosaics , CT Games , Education Games , Computer Technology Games.